Mongolian Gobi desert is one of the most interesting and mysterious places in the world and the 2 nd biggest Gobi desert after Sahara desert. 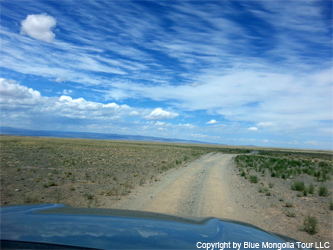 Gobi desert, the 6-th Biosphere Reserve Area in the world, is home for camel breeders, rich wildlife and vegetation. Gobi desert is very famous with its distinctive landscapes and fossils of petrified of dinosaurs. In the unspoiled nature of Gobi desert live rare animals that can be found nowhere else on the earth: one humped wild camels, wild asses and desert bear. Gobi is imagined as lifeless desert, but in reality gobi holds many thrilling surprises such as thousands of miles stretching sand dunes, small springs, rocky mountains, dry plains with semi shrubs, salt wetlands and oasis. Each guest to this strange spectacular place, full of mirages, is fascinated by the endless flat plateau, where time is still and only blue sky and scorching sun reign. Khongor /Darling/ sand dunes is located in the distance of 235 km from Dalanzadgad, which is the center of South gobi province. The spectacular sand dunes stretch 180 km long and 15 km wide. The highest point is 500 meters high and it is called Singing Sand. One amazing point of this sand dune is little lake called Adag. Also little spring, which contains considerable amount of chemical elements, is spring out in the green meadow near the sand dunes. A river Khongor runs on the north edge of the sand dunes. The nature view of all these landscapes involves each traveler's sight. This is the picturesque place, where camelback riding and sand skiing are available to be organized. A Bayanzag Flaming cliff is very famous for 2 things: 1. Dinosaur cemetery 2. Neolithic site. For centuries the nomads have frequently found bones of strange creatures what they call “dragons”, worshipped them, protected and refrained from touching or digging them. Actually the bones were not dragon's, but it belonged to dinosaurs that roamed the earth 70-75 million years ago. The large dinosaur skeletons on show in New York Natural History Museum were found at 1900-s by American Dr.Roy Chapman Andrews and the giant dinosaur skeletons in Ulaanbaatar Natural History Museum were found at Bayanzag cliff. These fossils were used later as dinosaur formation for making movie Jurassic Park. In sunrise and sunset time Bayanzag cliffs are looked like very legendary with color of red like flame. 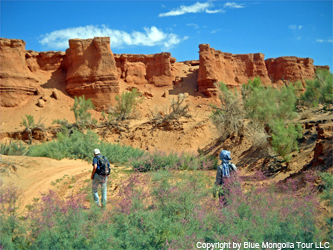 There is a big saxaul-gobi tree forest near the cliffs. 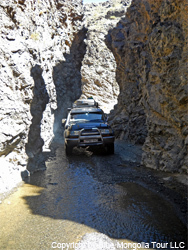 Vulture gorge in in Gobi desert is very popular with its nature beauty and wildlife. It is in the 2600 meters above see level and nestled between beautiful steep rocky peaks of Gurvan Saihan Mountain . It is very wide at the entrance; it narrows gradually into remarkable gorge with granite walls. There is a thick corridor of ice, which remains until the hottest summer days. Amongst wild life , herds of ibex and wild sheep inhabit and soar overhead adding firther diversity to the vast desert mosaic. After sunrise and in very earlier in the morning wild animals run down from peaks and a spring to drink a water. 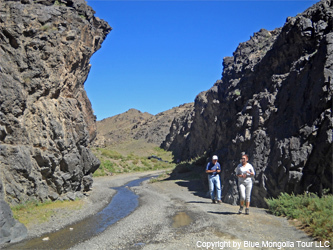 On the way to Vulture gorge, travelers can see a lot of interesting collections such as dinosaur eggs in Natural local museum. Khermen Tsav canyon could be called ground canyon because of it's unique formation. This canyon is the most legendary impressive place with its color and contrast. 14 km wide and 25 km long flaming colored canyon testifies that it was the sea bottom area and it turned into dry land many millions years ago. The canyon's gorges shelter for small golden sand dunes, green and red colorful bushes, and very old dried out trees, which all make you feel you are in the end of earth. During sunrise and sunset this canyon looks like very spectacular with the flaming color. Hiking and walking in this grand canyon is much exciting fun and timely photographing is waiting for you here. But also this is most well known place with its fossils of petrified dinosaurs and its eggs. 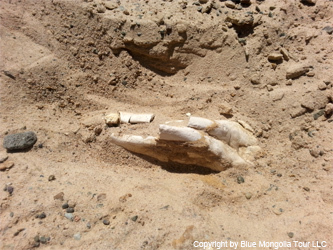 The amazing fossils of a small Carnivor named Velociraptor dating from Cretaceous period, found only in Mongolia, was sheltered in this place for many millions years. Still today this canyon is keeping the bones of dinosaurs in 7 species including the predatory ones and tiny ones. The fossils, found in this canyon, are the same with ones, which found in South America. 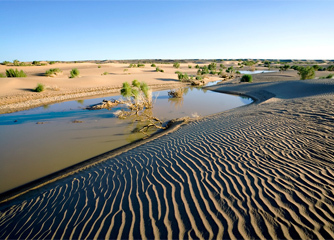 Zulganai oasis is located close to Khermen tsav canyon and is extremely beautiful with its nature view of a river running on edge of sand dunes. It is very difficult to believe that Gobi desert houses so magnificent small oasis in so hottest summer days. The oasis view is that the golden sand dunes with small lake it's inside are surrounded by bright green meadows, colorful flowers are growing in the meadow, tall bushes are playing with their leaves in the Gobi wind. You will have a chance to see the migrating birds in the small lake and camels trekking on sand dunes at the same time in one place. 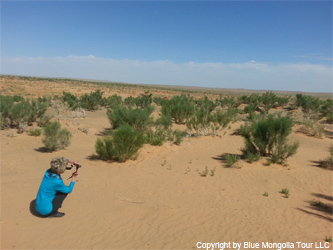 The nature view will show the Gobi desert attractive wildlife.